Thank you for joining us at Run to the Arts! 5 kilometers. Run or walk. Race or fun. At the one and only ArtFest Fort Myers. So much more than any ordinary 5K, the Publix Run To The Arts brings together the best that life has to offer: health and fitness, arts and culture, friends and family, and the scenic beauty of the Fort Myers waterfront. Post-race festivities include a scrumptious breakfast, a chance to make art at the Silk Experience, race awards, live entertainment, fabulous door prizes, and much more. Take part in a Fort Myers tradition, register for the Publix Run To The Arts today! 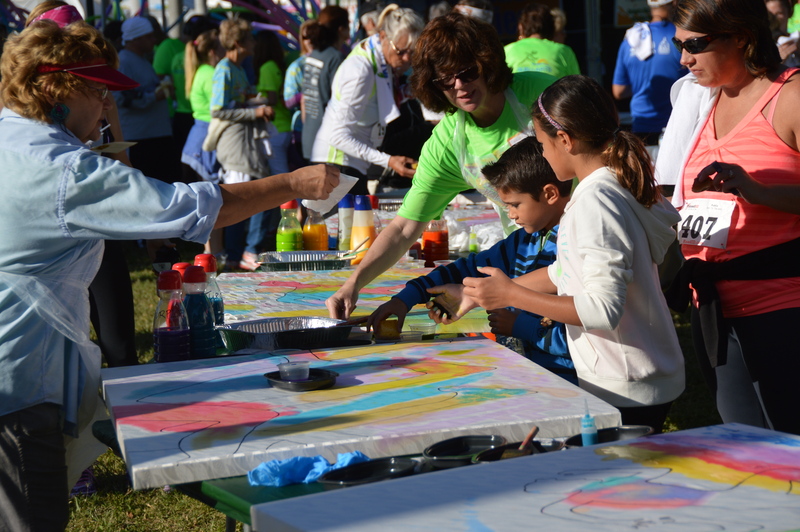 The Publix Run to the Arts isn’t just a race, it’s a full morning of fun that kicks off Sunday at ArtFest Fort Myers with exceptional art, entertainment, and children’s art activities. Your registration fee guarantees you a spot in the race as well as all of these runners-only goodies. 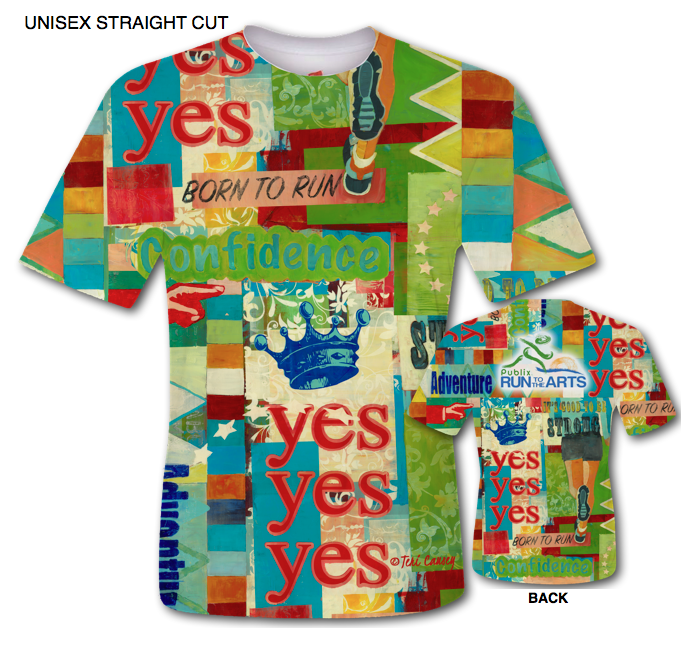 You'll get your very own Run To The Arts t-shirt with beautiful art by an ArtFest Fort Myers artist. Register by December 30, 2018 to make sure you get your size! 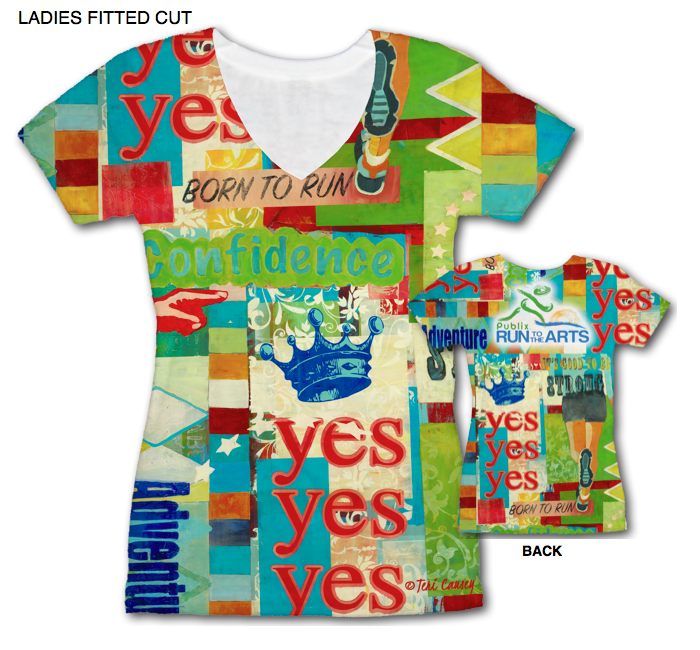 Your choice of styles -- standard straight-cut with crew neck OR ladies fitted cut, shaped with cap sleeves and v-neck. Both styles are made of the same great high-performance quick-dry fabric. Enjoy the beautiful new 2019 T-shirt by artist Teri Causey! Gather around the Start Line area at Monroe St. & Bay St. about 7:30am for morning energy. Free drop-in class, open to all skill levels. You'll get expert instruction on endurance, strength and speed training PLUS hydration, pacing and equipment tips. You can even go from couch to crossing the finish line! Every Saturday from 10:30 am to 11:00 am, December 15 to January 26, at KariKardio, 12901 McGregor Blvd #10, Fort Myers, Fl 33919. More info at karikardio.com or email karikardio@karikardio.com. All participants can view themselves crossing the finish line - on-line with bib number access. Available in the afternoon after Publix Run To The Arts. After you've worked out your body, you'll have time to exercise your creativity. Talented artists will be on hand to involve you in a group art creation – optional of course. Your race bib is your ticket to the post-race breakfast, featuring tasty Publix treats — muffins & bagels with all the trimmings, bananas, yogurt, coffee, and a few surprises. Enjoy live music and be the first to sneak a peek at the artist booths on Sunday morning, even before the festival opens to the public. Start your morning off with stretching yoga lead by Soni Yoga. Gather around the stage area at Run To The Arts Check-in about 7:30am for a wakeup with David. ALL awards will be based on CHIP TIME. There will be a starting time mat and a finish line time mat. Medals will be given for 1st, 2nd, and 3rd place in each age group. (See the FAQ below for age groups.) Plus awards for male and female overall, masters, grand masters, and senior masters. Print your exclusive Certificate on-line after Publix Run to the Arts. The course will begin and end on Bay Street at the corner of Monroe Street - front of Harborside Event Center. 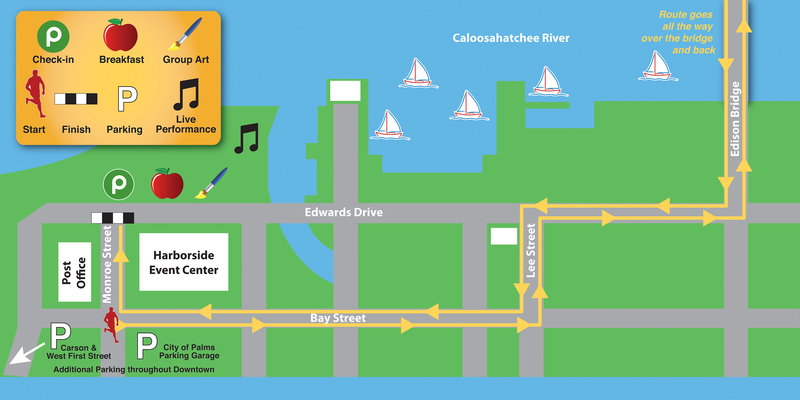 The route will be Bay St. to Lee St. over the Calossahatchee Bridge and back the same route – that’s right over the bridge both directions. With professional CHIP TIMING services by Endurance Sports Timing, you can have your results posted as soon as you finish the race. Free runners-only parking will be available at West First Street and Carson Street - 200 spaces. Look for the colorful signs. There is ample other parking along West First Street and all over downtown. Street parking is all FREE on the weekend. January 30 — Online registration closes at mid-night. There is no day-of registration ... everyone who wants to participate must register in advance on-line. Registration will close at 950 runner/walkers - there were 900 in 2018. After you've registered online, you can get your packet early complete with race bib and t-shirt and be all set for race day. Special Pick-up for early registrations by December 30: You will be notified of location and date/time by personal email message. Thursday, January 31, 2019 5-7 p.m.
Friday, February 1, 2019 3-6 p.m.
Saturday, February 2, 2019, 1-4 p.m.
8:15 a.m. — Race starts … woo hoo! 9:00-9:45 a.m. — Breakfast, awards, Group Art Experience, and door prizes — be there for all the fun! Click the question to show the answer. If you have a question not answered here, please contact us. Do I need my ID on race day? No, you won’t need your ID on race day. Just be sure to wear your race bib and you’ll be good to go! (Race numbers are required to participate.) You can pick up your bib packet the morning of the race if you didn’t get it at one of the early pickups, but be sure to arrive early. Can I pick up my friend's packet or have them pick up mine? YES! Friends can pick up each others’ packets. No ID is required, we’ll just ask folks to sign for what they pick up — so we can keep track of who’s got what. Pick up packets in advance (see dates and locations above) or between 7:00-8:00 a.m. on race day. Can children take part in the Run? You must be at least 12 years old to participate. Runners under 16 must have an adult on-site with them – adults don’t have to run but they must be present. All participants must be in good health and physically prepared to take on the challenge of a 5K. Children of all ages are welcome in the spectator and festival areas; however, please ensure that young children are accompanied by an adult at all times. Are there refunds? Can I transfer my registration to another person? No, there are no refunds or transfers. Sure you can! Walkers will start after all the runners have started. Do I have to finish within a certain time? Are strollers or other wheelie things allowed? Runners or walkers with “baby jogger” strollers are welcome. Please line up at the back of the line — you’ll start after all the runners have started. Wheelchair racers are also welcome and will start first, before the runners who are on foot. No handcycles, bikes, in-line skates, skateboards, or similar devices are allowed. Dogs and other pets are NOT ALLOWED on the course as they are a safety hazard to all runners. This rule will be enforced by race officials, without exceptions. Please leave your pets at home. Free runners-only parking will be available at West First Street and Carson Street. Look for the colorful signs. You bet! We’ll have water for you along the course. Will you hold my wallet/purse/backpack for me? There will be no facilities to check your belongings, so please make other arrangements for your gear. Do I need to be present to win an award? Do I need to be present to win a door prize? Yes, you need to be present to win. We’re here to help! Give us a call at 239-768-3602. Or click here to email us your question and we’ll get back to you right away. Run to the Arts is made possible by the generous support of Publix (long-time sponsor of ArtFest Fort Myers) — carrying on its tradition of being the kind of company a community can count on. Publix invites you to start your day with an invigorating run or walk and a healthy breakfast … then feed your mind and spirit at ArtFest Fort Myers. Kids love the Publix Art Yard, where they can make art treasures to take home, enjoy live performances, and buy artwork for just $5. Click here to discover what’s in store for you at ArtFest Fort Myers! You can use this form to send us your questions and we’ll get back to you right away.